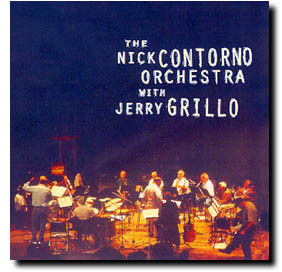 A salute to the Big Band era featuring Mr. Grillo and the Nick Contorno Orchestra with tributes to Frank Sinatra, Nat King Cole, Bobby Darin, Duke Ellington, and others. Grillo...has a strong, upbeat voice with an edge of cockiness in it that allows him to put a personal touch on these tunes made famous by other singers. Although Grillo's voice is unique, his presentation draws comparison to any number of predecessors such as Buddy Greco, Bobby Darin, and of course Sinatra. The assured phrasing, slight alteration of lyrics, and forcefulness of style allow Grillo to join that fraternity of singers who use their take-charge attitude to win over an audience. The band is always in a groove, the arrangements are crisp, and Grillo delivers a vocal punch to match the blasts of the brass section. It is a well matched teaming of talent.